Terzo - Modern Bathroom Toilet 26.8"
Name: Terzo - Modern Bathroom Toilet 26.8"
The Terzo is a contemporary modern bathroom toilet that embraces the latest trend in luxury modern bathroom design. The Terzo's gorgeous bowed bottom pairs exquisitely with it's sophisticated on piece tank. 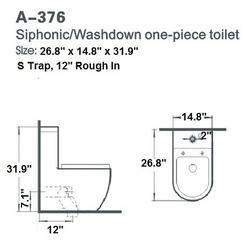 The ultra modern bathroom toilet has a one piece feature with sophisticated water-saving dual flush system and S-Trap design.